It was a year ago that I wrote that fateful cheque (yes, they still exist in France) and bought myself some speed, AKA the Bianchi Infinito. Since then, the two of us have seen some good times – most of them recorded in this blog – and we’ve also been together for 10,000 km (rounded down this time) as of today. 10,000. Sounds so big, and it is for me, considering the most I’d done before shaving my legs was around 4000 km. I thought it might be fun to find out how far 10,000 km is anyway. Google Maps tells me the following. Leaving my front door and heading east, I’d end up in Kathmandu, Nepal after 10,000 km. If I decided to go south (and take a ferry across the Mediterranean) I could make it to Dar es Salaam, Tanzania. If I wanted to do a trip in North America, I’d still need to ride an extra 1600 km as filler, after going from Key West, Florida to Anchorage, Alaska. Wow. For my fellow Gaspesians, that’d be exactly 500 times around the river! And since this is the first year I’ve used anything other than a spreadsheet to record my distance, here are a couple of extra stats from the Bicycling.com Training Log that I’ve been using. Number of Flats: 1, incredibly (this number does not include a couple that were completely my fault by pinching the tube when changing that first flat..). Number of Approving Comments on the Bike from French Riders: a couple. Mostly, they are far too cool for that. Number of Above Total Hours I Would Trade for Anything Else: zero. I really love to ride that bike! This whole year has been transformative (more on that when I get reflective sometime in December) and definitely one of the most fun and interesting in a while. Thanks Bianchi; you were worth every hard-earned Euro. Well, at least I lead you in the number of falls. Congrats and bonne route for the next 10,000. Thanks, Herr Kaa. I’ll try harder next year, but seeing the aftermath of your wipe-out was as close as I want to come to one, I think. Congratulations on the 10,000km. The average speed is impressive considering the number of big hills you seem to go up. Thanks, Tootlepedal. I’m still recovering from the fact that you reached the same milestone weeks ago…hills or no hills. Congratulations Gerry, 10,000k’s, that is approx Perth Western Australia to Sydney, via Adelaide AND Melbourne. When you get to Sydney, take a photo of the Opera House, turn around and go back to Perth! You’ve earn’t a Coopers or two! And Zero off’s even better! Thanks, Steve! And I’ll take that Coopers, thanks. Don’t forget the six-pack next time you come over! Fun post, it inspires me to count miles, ahhh kilometers … But first a question, do miles with no forward progress count? That would be on the stationary setup, the only pedals I usually push in the winter! Perhaps I’ll make that a poll question. Suze, I think it is generally agreed that counting kilometers is the way to go. I’d only be at 6000 if I were riding in miles. Just not enough. Good luck going nowhere inside. I’m fighting the urge to buy a trainer, but unless we start getting snow in Le Sud I really have no good reason. Congratulations – that is a seriously large number regardless of the system of measure! Perhaps your most impressive achievement is suffering only one flat during that entire length. As one who had nine flats last year over 2,000 miles (about 150,000 kms, I believe), I greatly appreciate non-flat riding. Well done and I trust you are working on your 15,000 km logo for next December! Thanks, Steve. The secret to not getting flats is apparently not to ride in North America. Rob says he gets plenty of them each year, too. I’ve just checked Google and there are a few 15,000 images to grab. That, I’m afraid, is the easy part of such a goal. Just to stick my two bits in ..the road surfaces where i’ve been in southern france, even in the high country are far better, magnitudes better, than here in New England. Plus, the French don’t seem to throw anything like the amount of garbage, including glass, out their car windows, that Americans do. It is a mystery to me. I grew up not far from Steve and my sister is still there, and though it has been a long time since I rode there, while the road surfaces may be better, the litter is at least as bad. Suze, I’ll have to take your word for it since I really haven’t ridden much back home. I was wondering if the lack of shoulders here had anything to do with it. It seems that when I do ride on bigger roads here, the shoulders tend to have much more crap on them. Would riding on the same area of the road that cars do reduce the chance of punctures? Gerry, this will be out of conversational order….. yes absolutely ride on the roadway, almost always the shoulders are hideous. But there aren’t often shoulders where I live either. The amount of litter is disgusting. Sometimes we try to count pedal revolutions between garbage, but it is too distressing. I think that it accounts for a fair number of flats. Now that’s commitment! No crashes is pretty impressive. There are two types of cyclist, those who have crashed, and those that will crash. I’m in the latter catagory many times over. As for flats, well there’s a reason I can change a flat in under 2 minutes. Rubber-side-down and keep enjoying the ride. Thanks, Coach! I knew I shouldn’t have advertised such facts, however. I’m sure I’m jinxed now. 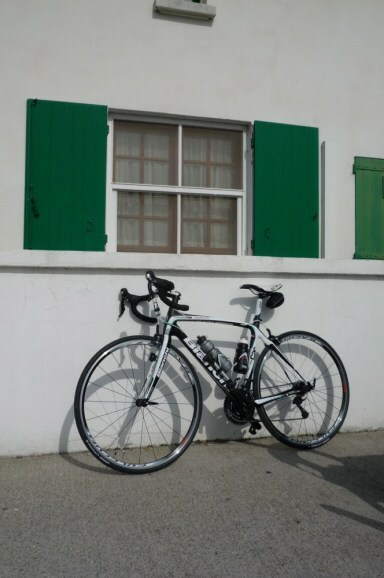 Ah, so I have one more thing to thank my Bianchi for then – another blog buddy! Thanks, Ron. Ok 10,000 kms in a year on a doggy knee and you are fretting about doing a couple of etaps?? well done .. you might need a oil change!! I’ve got more time on my hands than the normal guy who isn’t retired yet – that explains most of those kilometers. Plus I ride all year round down here so it’s really spread out over the entire year. Not in the league of Forrest…yet. Well, I’m still married! I guess that’s a good sign. That’s very impressive Gerry. Especially as a lot of those kms seem to have been up incredibly steep mountains. I’ve done a bit of totting up and Chris and I are doing a pretty steady 150 km per week. We don’t cycle generally in December and January – just too flipping cold and icy – so that gives us about 6000 km a year. Not bad for a couple of people who are decidedly more middle-aged than they’d like to be! We have one fall between this year (Chris the other day, the pillock), and a good few more punctures than you (bramble thorns are the main culprit on the green lanes round here). And as for average speed, well, I think you’d leave us in a cloud of dust! That training log sounds cool. I think I’ll start to keep one too. The log is free and easy. Pretty simple compared to what you get with the Garmins and Polars of the world these days, but good if you are still in the stone age of cycling, like us (although, stay tuned. Something’s in the mail as I write this…). Nice mileage for a busy couple like you. I’m surprised you have any time to get off the farm, with all those animals and kids running around. The average speed was actually higher than I thought it might have been because lots of those rides were easy ‘recovery’ rides, i.e. just strolling along at 20 or so. I think the 5 Ventoux descents brought the average up a little! Good luck. I’m pretty cautious, I think, and I usually buy new tires before the old ones die completely. that could be another reason I’ve been lucky. 8,600 km is pretty good though, I’d say. What are you running on your bike? This year I have broken 10 spokes, replaced two wheels, relaced one wheel, replaced two tires, three flats and replaced a set of break pads …but no falls, whew! So your stats are impressive. The world lies just beyond the handle bars …keep on riding. You taking that thing off-road or something? My wheels are as true as the day I bought them, still, which is irritating because I’m really looking for a reason to buy new ones.